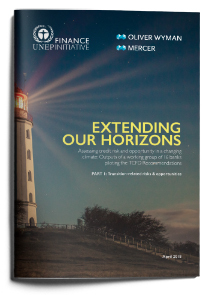 This report is the result of a collaboration between sixteen of the world’s leading banks with UN Environment Finance Initiative (UNEP FI), and management consultancies Oliver Wyman and Mercer to pilot scenario-based assessments of transition-related risks and opportunities as envisioned by the Recommendations of the Financial Stability Board’s Task Force on Climate-related Financial Disclosures (TCFD). As an inaugural exercise, the output of this process is intended to provide a first, but critical step, in a longer process of responding to the TCFD recommendations. Focusing on the transition-related risk and opportunities, which are associated with the transition to a low-carbon economy the report is the first in a two-part series publishing both the transition risk and physical risk assessment methodologies developed through the Working Group’s collaboration. The second report, covering physical risk assessment methodologies will be released in June 2018.